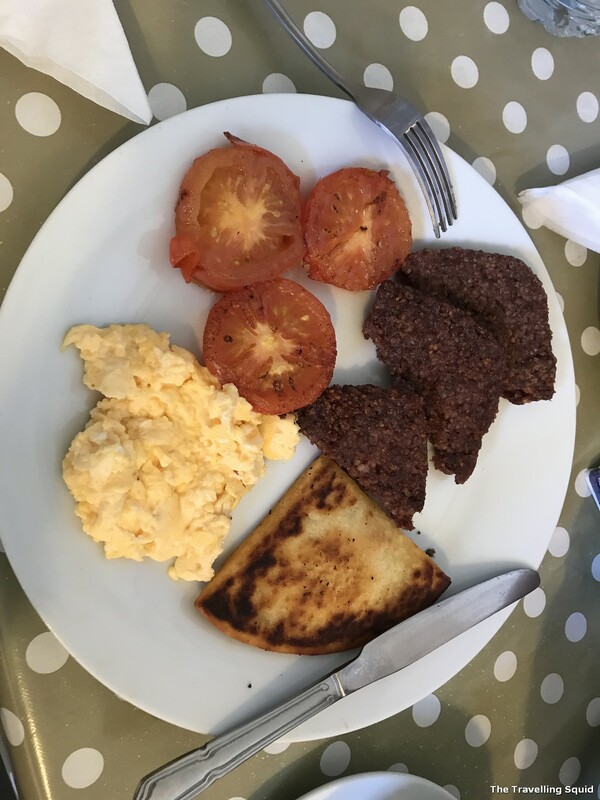 I didn’t order haggis – the potato scones, scrambled eggs and tomatoes were great. 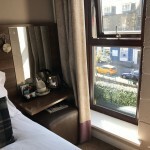 If you’re in Edinburgh and would like to have a home-cooked Scottish breakfast, I have just the place for you. 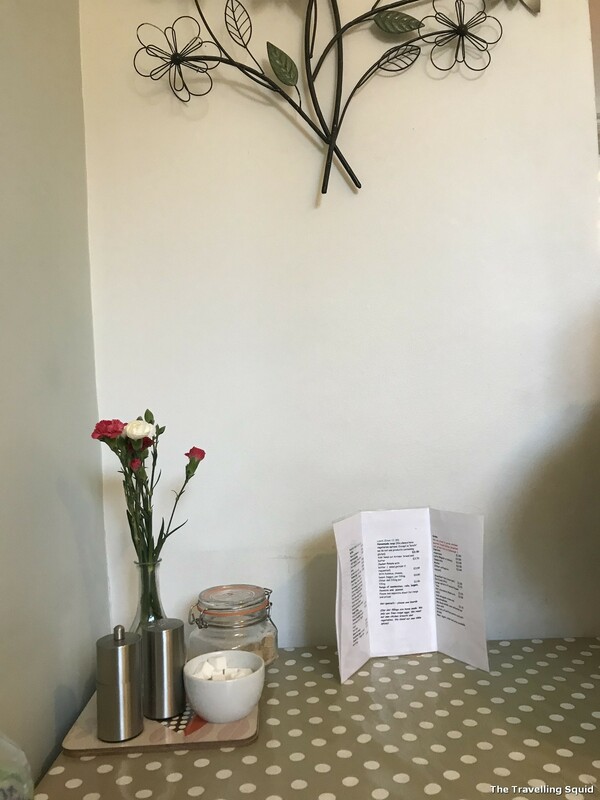 It is a quaint little cafe – makes pretty decent coffee, and the breakfast, delish. 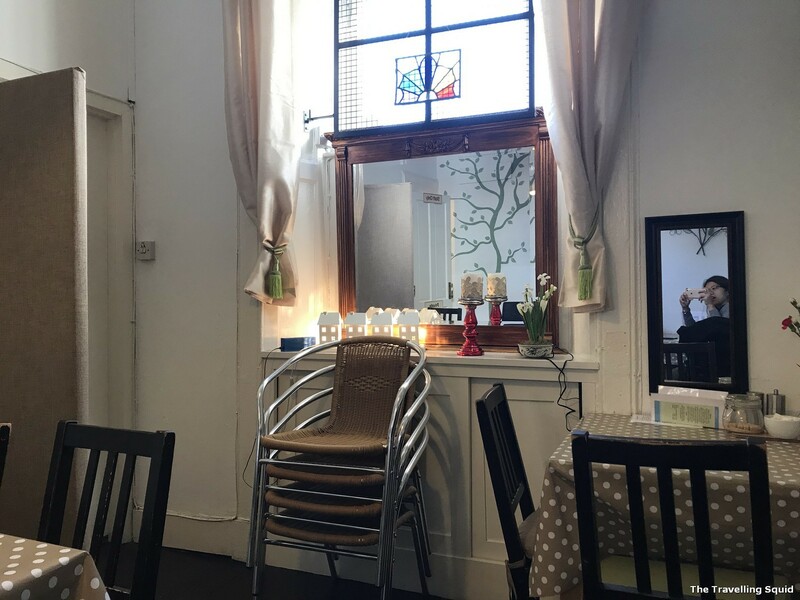 The set up makes one feel that you had entered someone’s kitchen, all ready for a home-cooked Scottish breakfast – with coffee, scrambled eggs, haggis and potato scones – a good reason why you should visit Sugarhouse Sandwiches in Edinburgh for breakfast. 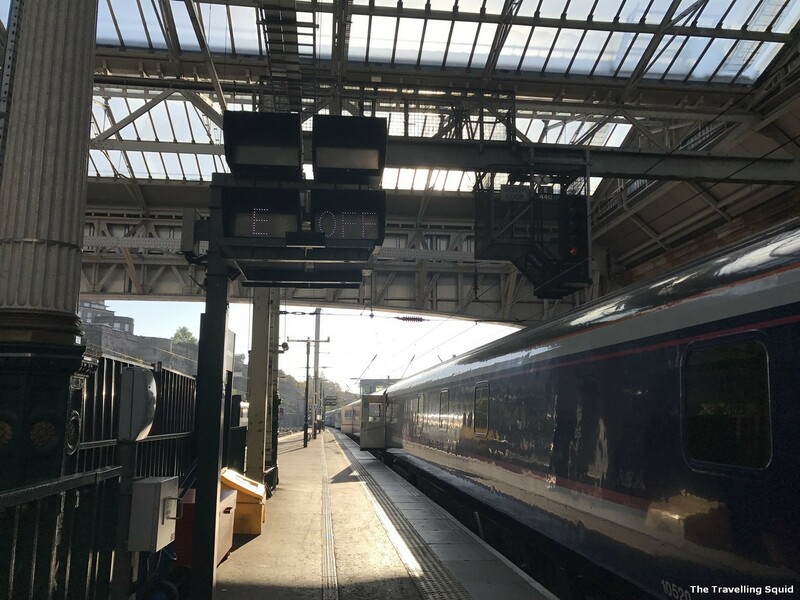 After a night on the train (travelling from London to Edinburgh), pushing suitcases some of Edinburgh’s mighty slopes, we were somewhat disheveled when we arrived. When we were done putting away our luggage at the hotel, it was about 8am and we were hungry and in need of coffee. S did some googling, and found that this quaint little cafe which opens at 8.30am. We decided we could wait – and it was worth it. 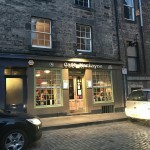 The shopfront was interesting – I also observed that most shops in Edinburgh had a metal gate to protect the glass windows – I’m guessing it’s to protect against burglars and drunks. The walls were painted with little trees, and it was all quaint and cosy. Like you had stepped into someone’s living room. It’s quite amazing how simple things like a polka-dotted table-cloth and a little flower on the table could change the atmosphere. Just like sitting in a friend’s dining room. The food was good – much-needed after a 7 hour train ride. 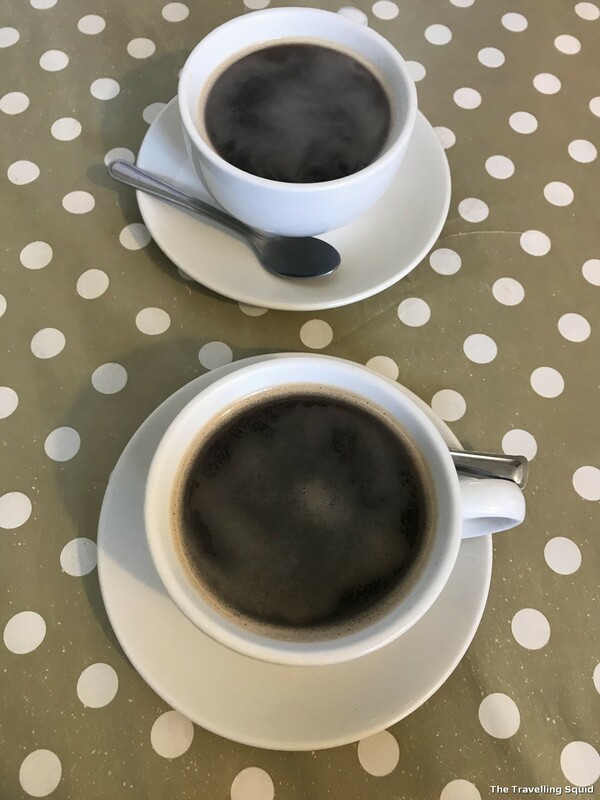 We both ordered a big breakfast – you could choose specific items from the menu. 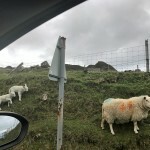 We were very pleased after the meal and it was good value. 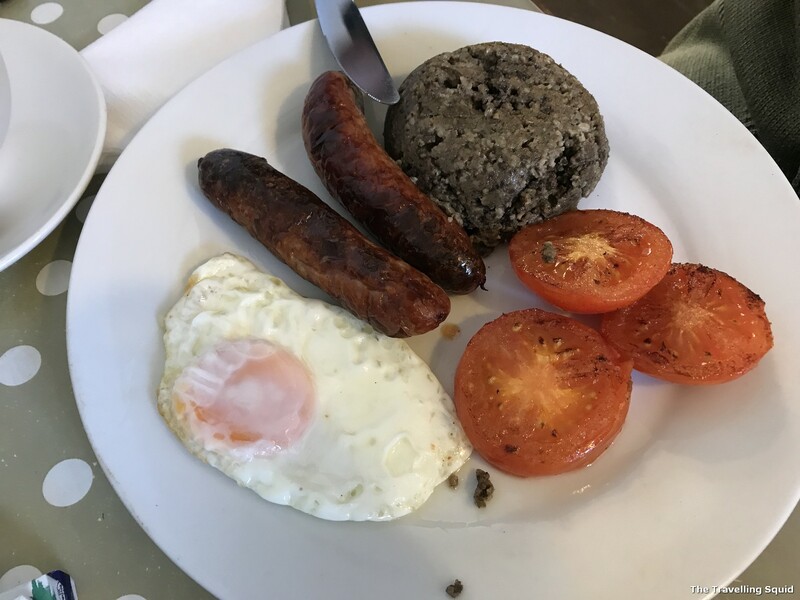 For the big breakfast, you can choose from a few items – haggis was not one of my favourites. It cost £5.55 for a plated breakfast (which is really good value). 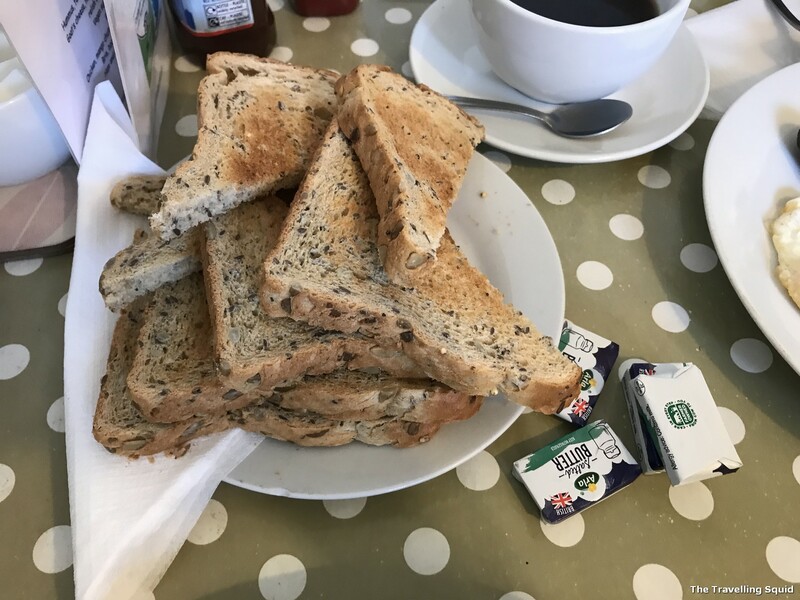 The toast was great – crispy and I enjoyed munching on the little seeds in it. 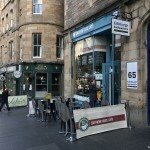 If you’re in Edinburgh, do stop by Sugarhouse Sandwiches in Edinburgh for breakfast. 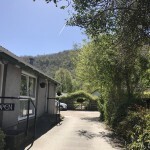 It’s the place for an authentic Scottish breakfast, and you get a feeling that the owners have put much time and effort into putting this place together. Enjoy!